Twelve Steps of Narcotics Anonymous. It is our hope that in our correspondence we will help the suffering addict find the solution we have found. 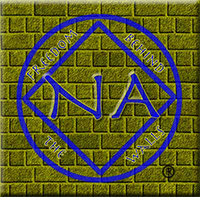 SAN FERNANDO VALLEY AREA'S NA FREEDOM BEHIND THE WALLS SUBCOMMITTEE and the SOUTHERN CALIFORNIA REGION’S NA SPONSORSHIP BEHIND THE WALLS COMMITTEE are working together. Many unassigned, incarcerated male and female sponsees need YOUR assistance in taking the Twelve Steps of NA. 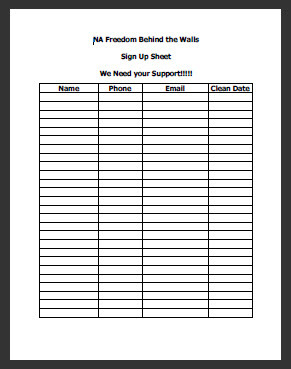 We are asking you to give your guidance to an incarcerated addict in need, anonymously, through the mail, and through this sub-committee. Without your help they may not be able to attain the freedom that we enjoy today. Please contact Subcommittee Chair Patty K for more information and details. 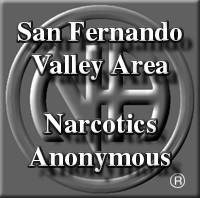 Any addict can join the San Fernando Valley Area NAFBTW Subcommittee. To sponsor someone in an institution, an addict needs to have been clean for 2 years and have worked the Twelve Steps and have had no prior contact with, or knowledge of, their assigned sponsee. The sponsor must be off parole and have no convictions in the past 12 months. For your group’s literature table. Our primary purpose is, through the mail, to provide a sponsor to work the Twelve Steps of Narcotics Anonymous to those people who are incarcerated in an institution, and are not able to meet potential sponsors at their local NA meetings. Our interactions will only be via mail, not by telephone. Our mission is to ensure that any addict seeking recovery through a working knowledge of the Twelve Steps of Narcotics Anonymous has the opportunity to do so, even in an institution.